It is a common misunderstanding that infants do not have sinuses. Many people do not understand what sinuses are. Thanks to the omnipresence of TV ads touting the latest quick fix for "sinus headaches," many people think they have sinusitis whenever they have the least bit of nasal congestion or facial pain. There are many other problems that can cause nasal congestion, postnasal drainage and facial pain/headache. Sinusitis is only one possible cause of such symptoms. Assuming that your question was not simply a product of random curiosity, I would guess that one of two things may be true: (1) you have a baby who has been diagnosed with sinusitis, and you were surprised that this could be possible, or (2) your baby has nasal congestion or thick, discolored nasal mucus, and you are wondering if this could be a sinus infection. Quick answer to both concerns: sinusitis CAN occur in infants, but (as with adults) there are a number of other possible explanations for nasal congestion and thick nasal mucus. Back to the anatomy lesson. Sinuses are best thought of as air pockets in the bones of the head. These air pockets are connected to the nasal cavities via narrow ducts. The sinuses are lined with a specialized tissue, mucosa, which produces mucus. The mucosal cells have tiny, finger-like projections called cilia which beat rhythmically, so as to push the mucus out of each sinus, into the nasal cavity. There is a constant flow of mucus out of the sinuses, into the nasal cavity, down the back of your throat, into your belly. There are four areas that contain sinuses. There is a single maxillary sinus located in each cheekbone, immediately beneath the eye. The ethmoid sinuses are a honeycomb-like network of air pockets located between the eyes and the nasal cavities. The frontal sinus is located immediately above the nasal cavity. If you place your fingertip between your eyebrows, you will be pointing to the center of the frontal sinus. The frontal sinus extends above each eye, within the bone of each eyebrow. Finally, the sphenoid sinus is located deep within the head, immediately behind the ethmoid sinuses. It can be cured with the natural therapy and homemade therapy. Abdominal pain is pain that is felt in the abdomen. The abdomen is an anatomical area that is bounded by the lower margin of the ribs and diaphragm above, the pelvic bone (pubic ram us) below, and the flanks on each side. Although abdominal pain can arise from the tissues of the abdominal wall that surround the abdominal cavity (such as the skin and abdominal wall muscles), the term abdominal pain generally is used to describe pain originating from organs within the abdominal cavity. 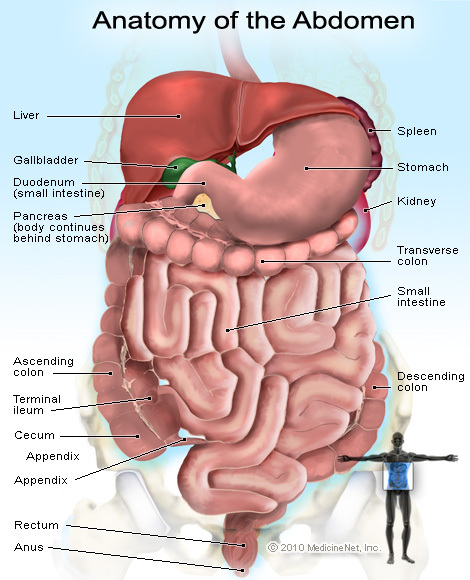 Organs of the abdomen include the stomach, small intestine, colon, liver, gallbladder, spleen, and pancreas. Occasionally, pain may be felt in the abdomen even though it is arising from organs that are close to, but not within, the abdominal cavity. For example, conditions of the lower lungs, the kidneys, and the uterus or ovaries can cause abdominal pain. On the other hand, it also is possible for pain from organs within the abdomen to be felt outside of the abdomen. For example, the pain of pancreatic inflammation may be felt in the back. These latter types of pain are called "referred" pain because the pain does not originate in the location that it is felt. Rather, the cause of the pain is located away from where it is felt. What causes abdominal pain?Abdominal pain is caused by inflammation (for example, appendicitis, diverticulitis, colitis ), by stretching or distention of an organ (for example, obstruction of the intestine, blockage of a bile duct by gallstones, swelling of the liver with hepatitis), or by loss of the supply of blood to an organ (for example, ischemic colitis). To complicate matters, however, abdominal pain also can occur without inflammation, distention or loss of blood supply. An important example of this latter type of pain is the irritable bowel syndrome (IBS). 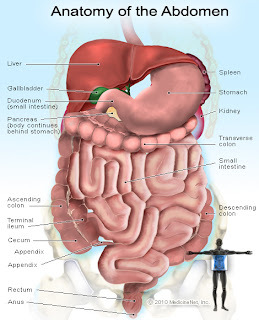 It is not clear what causes the abdominal pain in IBS, but it is believed to be due either to abnormal contractions of the intestinal muscles (for example, spasm) or abnormally sensitive nerves within the intestines that give rise to painful sensations inappropriately (visceral hyper-sensitivity). These latter types of pain are often referred to as functional pain because no recognizable (visible) causes for the pain have been found - at least not yet. There are some herbal or homemade therapies to cure this.